Daily Illuminator: This Exhibition Is DOOMED! January 12, 2013: This Exhibition Is DOOMED! Toronto's Museum of Inuit Art is putting up a new exhibition in Spring of 2013 called The Art of Play, to explore the history of games in the Arctic and examine the impact of the medium in a modern context. 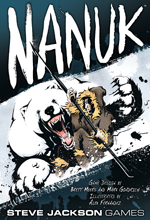 Naturally, we're sending them a copy of Nanuk. Hopefully, they won't get too caught up in dooming each other's hunts to finish the exhibition in time.